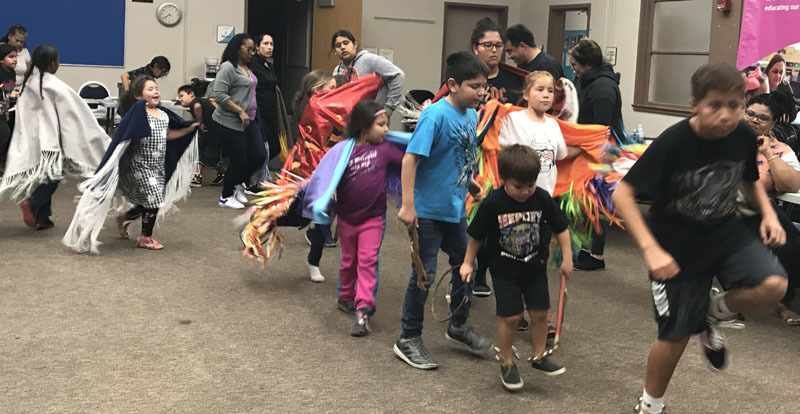 The Soaring Eagle Dance workshop on April 10 was filled with anticipation of the coming pow wow season. The upcoming Saturday Pow wow at San Diego State University will really start things off. Several of our 'Eagles' are honored to serve as Head Staff. It speaks to the quality of our program when dancers and their families are asked to fill these important roles. Feelings of pride fill our hearts. We started off the evening with some stories from Chuck for the children, another element of our collective oral tradition. Everyone seemed to settle in to listen. 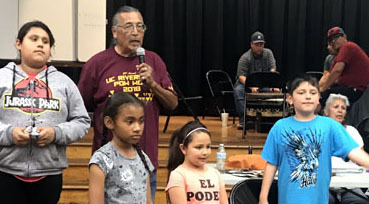 He then brought the young ones together for our blessing, carrying on the tradition of talking to our creator and giving thanks for the many blessings we receive. A young voice was heard to say 'Elders first'. Lasagna, stew, pizza, salads and fruit were part of the choices this evening. With so many dancers we just started off with an Inter-tribal or two or three to get the circle filled. Most of our dancers now have regalia, so with a little imagination it looked like a pow wow arena filled with dancers. We welcomed a new Pima family and then on went a set of bells and they joined in the dancing. The Soaring Eagle experience once again. A few weeks back our dance instructor Chuck showed the young dancers some history and background on the Sneak-Up. 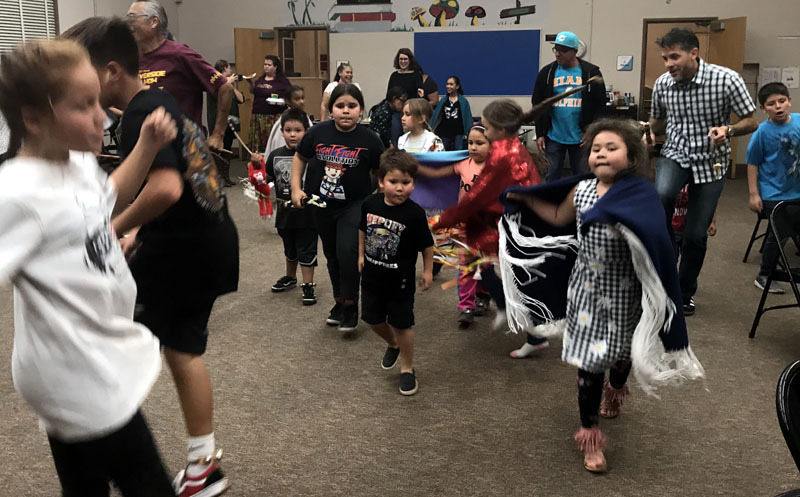 Each time the songs are sung and we dance this traditional dance, these teachings come out and you can see real growth from our dancers. Hands or fans go up to help 'see' in the distance and often we keep ourselves low. We had over a dozen prizes for the winning tickets. It was good to have so many young ones there to reach in over and over. Smiles all around. More smiles for the many birthdays we celebrated. There were some who were too shy to be in the picture or tell their age. The singers brought out a Round Dance birthday song and that was followed up with big pieces of cake. Hope to see you all at the next 'doings'.